Learning to knit has a lot to do with feel. When I was teaching myself to knit from YouTube videos I did a lot of things wrong that turned out not to be wrong after all. I just tried stuff until I thought it felt right and then kept doing a whole scarf that way. 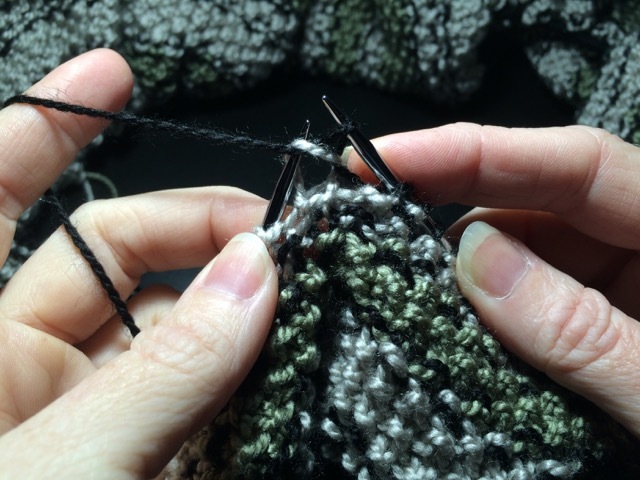 The knit stitch will tell you if you are doing it wrong. It will feel tight and unyielding. If you are entering the stitch properly it should stretch and give in to the needle and happily take the new loop of yarn. 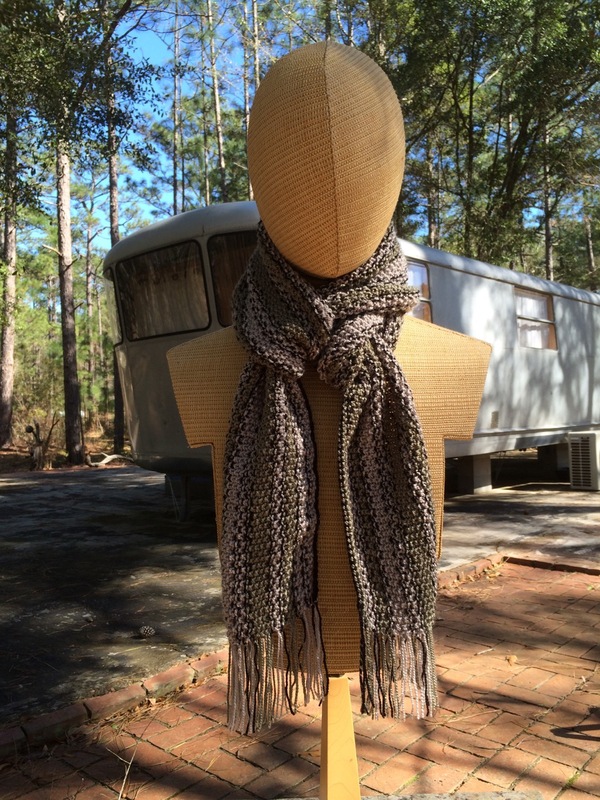 The first thing I knit was a seed stitch circle scarf. 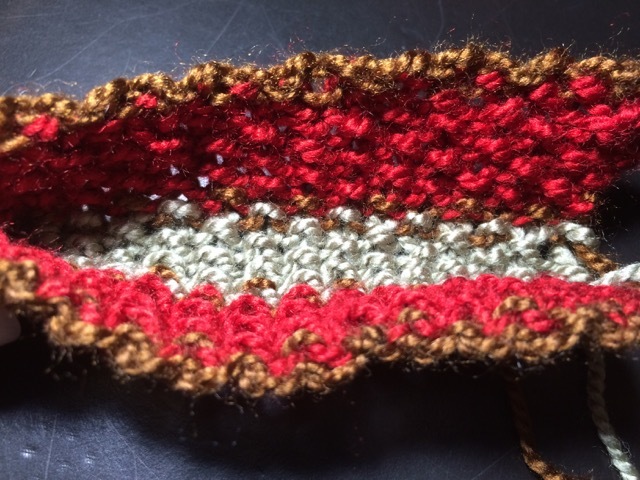 Seed stitch means you alternate a knit stitch and a purl stitch all the way around in a circle then on the next row you bump it over one so it comes out like a checkerboard. I think a seed stitch scarf is a good beginner scarf for combination knitting. It looks the same on the front and back and it doesn't curl. Here's how you do it. Get some circular needles in the size given on the ball band of some yarn you like. If you only get one ball it won't be very wide. I started with bulky yarn and cheap needles from the fabric store but quickly learned to loathe them. (Needles is a whole blog post.) Here's a good starter needle on Amazon, HiyaHiya 20"
Size 11 needles. Green cable is a 16" HiyaHiya stainless steel needle. much longer the needles are on the longer cable? and tie off fringe. I hope it comes out over 60" long but the needle is only 49". To start your circle scarf cast on a lot of stitches. Use the ball band of the yarn to decide how many. It will say how many stitches are in 4 inches. That's based on stockinette, which is tighter gauge than seed stitch. 40 inches is a good length for a circle scarf you can wrap twice, so you could multiply the number in the box by 10 and hope it doesn't come to your knees. I recommend multiplying by 8. For example, Hometown USA, a readily available colorful acrylic yarn says 9 stitches in 4 inches on size 13 needles. 9 x 8 = 78 stitches. For seed stitch in a circle you need an odd number, so add one. The smaller your yarn and needles the more stitches you will need. I like to use the cable cast on for the beginning of a long circle. Here's a good video for that. I like this channel a lot. Her handle is iknitwithcatfur. She uses natural lighting and natural audio. I like the airplanes particularly. She doesn't knit combination, but it doesn't matter. Counting this many stitches can be a pain. I am not good at counting myself. I'm uniquely bad at it in fact. I don't try to count as I go along. I do a good mess of stitches then go back and count them. There are some tricks that help. I like to use a set of small double pointed needles. I pick up a needle to point to the stitches as I count them. I get to 10 and jam the needle in between 10 and 11. I pick up another needle, count 10 more, jam in the needle. Double pointed needles come in sets of 5, so when I get to 50 I use a marker that works like a safety pin to mark that one. Now I can retrieve the needles I used for decade markers and I don't have to count those 50 again. Work out a technique that helps you. If you like to count as you go along you can slip markers on the needle. You can't move them later though if you counted wrong so that technique is not for people with dyscalculia like me. I found a cast on that works better for a seed stitch scarf knit horizontally. I found out about it from Jeny Staiman's blog. She made her own video for how to do it but I got frustrated trying to do it that way. She posted a links to another video that shows how to work it with hand motions more like a long tail cast on and I got it. I'm not embedding this video because the background noise is shockingly bad. The next step is to join your knitting in the round. This video shows you how and illustrates what to watch out for. The scarf I'm making now I accidentally twisted it. I am going to cut it apart when I'm done so it doesn't matter, but it means I have to push the balls of yarn through the middle with every row or it gets hopelessly wrapped up. Now let's look at a video where the demonstrator actually knits and purls the way I do. I learned a lot from watching this channel, sheruknitting.com. She is about to show you why you are doing this in the round and not flat. Notice how the edge stitches are worked differently. Also when she gets to the second row everything gets really weird. If it starts to freak you out just pause it. I have still pictures to explain what is happening. The first row she knits is exactly what you need to do to start a seed stitch circular scarf in combination. But the second row is different because you aren't working on the back. This is what is great about this project. Let me show you in still pictures what is happening. 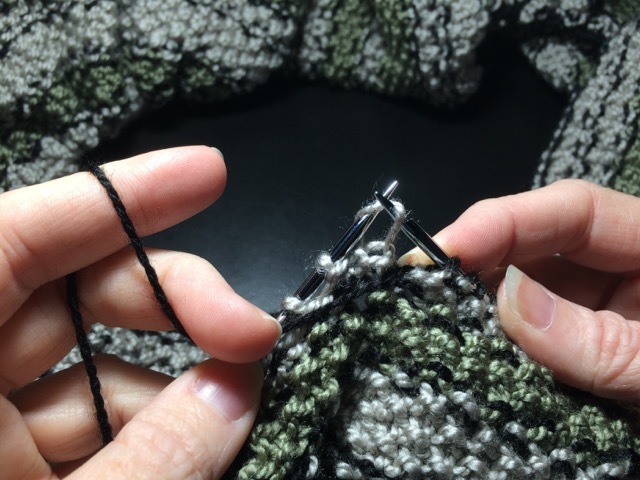 Gray yarn: This is what a knit stitch looks like in combination knitting. Purl stitch on right needle, knit from last row about to be dropped from left needle. If you watch how the pink yarn video wraps the yarn that's how I did it, but the right leg of the yarn was in the front for me because I'm knitting in the round. How handy! Now for the next stitch. This was a purl stitch on the last row so now I need to knit it. I can tell it's a purl because the loop from the last row is in the front making a little collar around the stitch. The working leg of the yarn is in the back of the left needle. I can tell I picked up the correct leg of the yarn because the stitch is nice and open. The yarn is held in back and the right needle is inserted to come out in the back ready to scoop up that black yarn that you can't really see. Now I scoop the yarn in back and pull it through the loop. I don't really do any wrapping with my left hand, I just scoop it up. 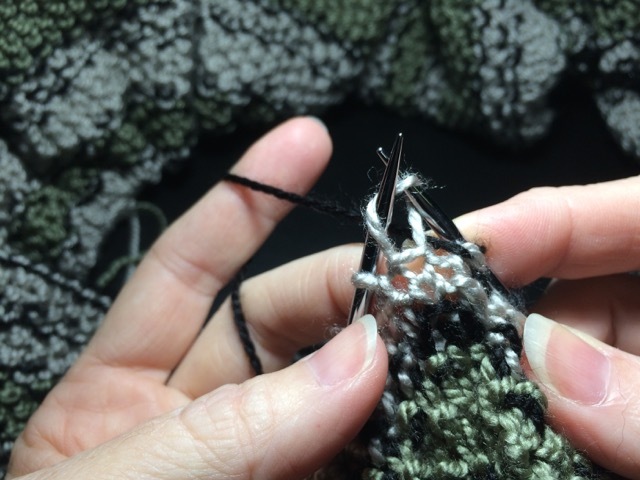 Now if I let go with my left thumb that gray stitch drops off and my new knit stitch is on the right needle. See how the black yarn goes from front to back? Compare what is going on with that black yarn on the right needle between the knit and the purl. It's that back to front/front to back disparity that makes combination knitting different. If you watch more videos you will see most knitters wrap the yarn over the top of the needle to purl. This is frankly very hard. This is why people say they hate to purl. I use the same motion to knit and purl, only difference is a slight tilt of the wrist to put the yarn in front of or behind the left needle so it's in the right position to scoop it up. The black yarn is going from back to front and it has a little gray collar around it. That's a purl stitch. 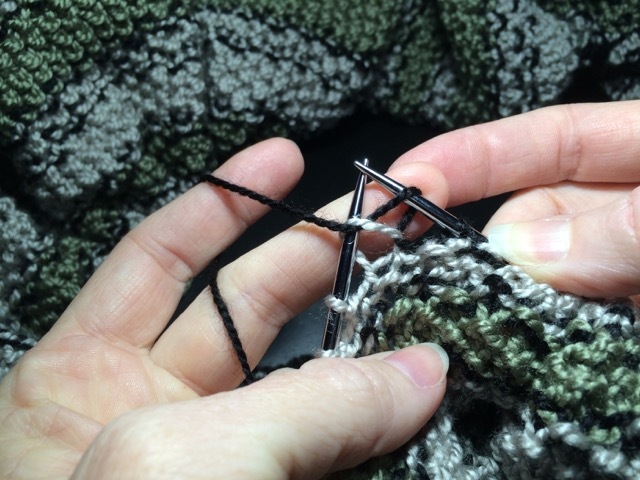 The gray yarn on the left needle is looped front to back and has no little collar. That's a knit stitch. I like to work seed stitch this way because it gives you an extra clue what you need to do. Knit in back, purl in front. And that puts the same amount of yarn in every stitch. Here's a video to introduce the concept that my way of knitting is incorrect. Once I accepted that I liked my way better I worked on understanding the terminology so I could watch videos by people who knit the correct way and be able to quickly transpose what they said for my twisted purl stitches. VeryPinkKnits is one of my very favorite tutorial channels. I've watched all of Staci's videos and knit several of her patterns. She knits nothing like me, but I don't care. I still learn a lot. So you got through the cast on and the first round, what if you get back around to your end of round marker and you see you counted wrong? 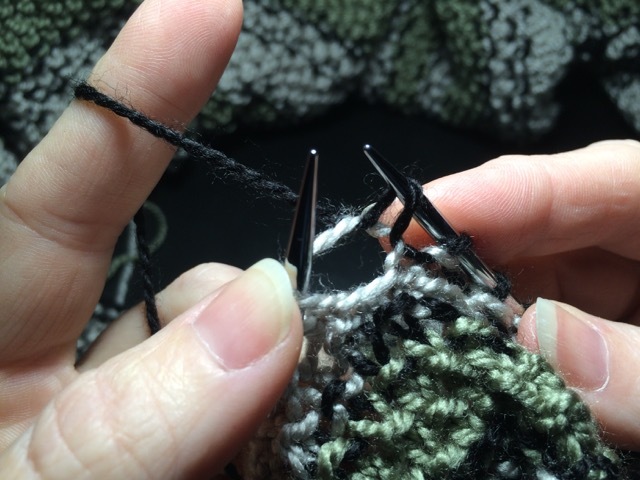 If you have an even number instead of an odd number of stitches, then you could end up purling the last stitch and the first stitch is also meant to be a purl instead of a knit. Here's what you do. Knit two stitches together at the beginning to get your pattern to come out. Only one row will be wrong. Be sure the working legs are both facing the same way and put the needle through two at once. Use the row below to set the pattern. BE SURE YOU GET THE FIRST ROW RIGHT! If you see you made a mistake, here's how to go back and fix it. To get a nice wide cowl you will probably need two balls of bulky yarn. 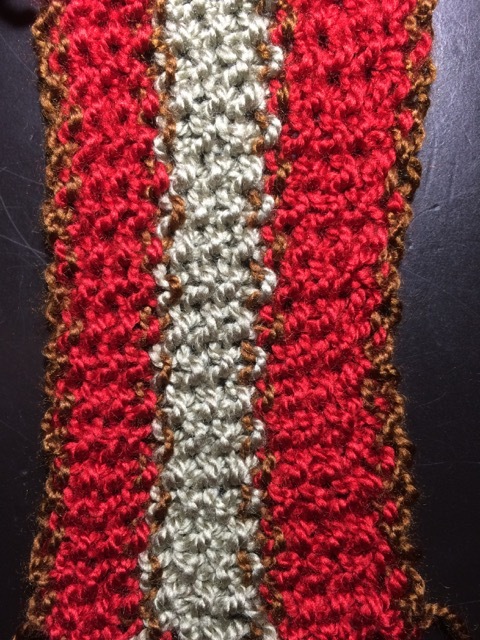 When I'm using bulky acrylic yarn I find a nice place for a join and knit a few stitches with the new yarn and then hold the two tails crossing each other like they were continuing each others path and then I sew them together with a needle and thread. I cut the extra off each side after I tie a good knot in the thread. I'm paranoid that one day I'm going to accidentally cut off the working yarn instead of the tail but so far so good. When you get ready to bind off you should use a bigger needle if you have one. It doesn't have to be circular. 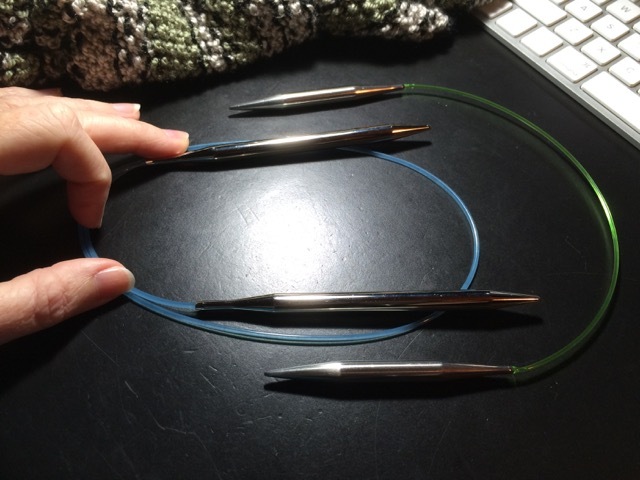 Just drop the right needle and pick up a straight needle and bind off. 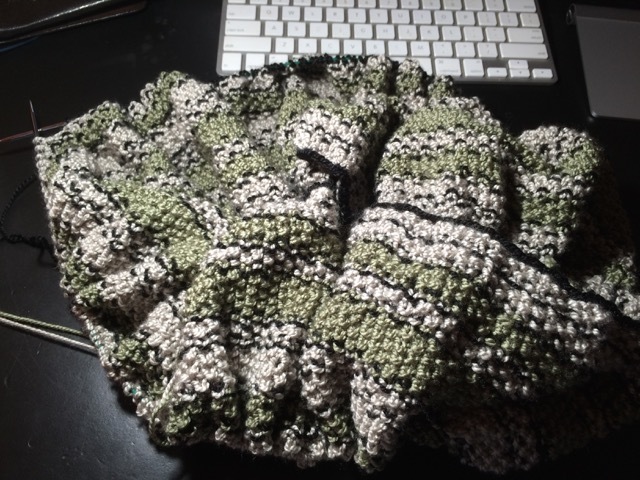 Because you did a cable cast on you want to do a knitted bind off. This will match the other side. Be sure to alternate picking up the front and back leg of the stitches to knit them. The last step is weaving in ends. There are good videos for this too. It depends a lot on the kind of yarn you used. For bulky acrylic you may find it best to weave the end in a little way with a needle and thread and then sew the tail to one of the legs of the yarn of the piece before cutting the tail. Weaving in straight up really only works for wool. This splitting the yarn and then knotting it technique is one I like a lot for worsted weight yarn. I did 5 different swatches trying to find a cast off that would be as stretchy as the slip knot cast on. I tried Jeny's Surprisingly Stretchy Bind Off which is the absolute stretchiest and it still wasn't stretchy enough. I tried a rolled stockinette edge that was increased one stitch in five to have more actual stitches bound off. Still the edge was the stopping point of the stretch. What I need is a way to cast on both sides and have no side bound off. I know how to do the opposite, use a provisional cast on so both sides are bound off. But I could find no solution to this online. I decided if Jeny can make up a stretchy bind off then I can make up a way to have a cast on both sides of a steeked seed stitch scarf. What you do is cast on slipknots on a big needle and then do a modified kitchener close to marry those stitches to the edge of the scarf. The chant for doing kitchener is "knit off, purl; purl off, knit; knit off, purl; purl off, knit" For a seed stitch graft you say "knit off, knit; purl off, purl; purl off, purl; knit off, knit." Slip knot cast on edge match in seed stitch. Right side is the graft. but it FEELS like a match. Edge on view of slip knot cast on and slip knot cast on grafted to the edge of the work. I'm going to do a 200 stitch version of this manly color scheme. I'm seeing it with a brown barn coat or leather bomber jacket. I may try to do a video of it. This concludes my first how-to knitting blog post, featuring how to learn to knit from YouTube when nobody is doing the same thing. I enjoyed making it, so I guess that means it's worthwhile. Also I invented a way to take pictures with my iphone using my nose so I can have both hands in the picture. Is handy the right word for that? Or nosey? UPDATE: Here's how that scarf turned out. It is 94" wrong. I mean long. My gauge estimate was off by a factor of 2. Still, it looks good wrapped this way. It's like making a loop and passing the ends through, but there are two loops. Possibly impractical in actual use.